OKLAHOMA CITY, Oklahoma, June 14, 2010 (ENS) – The annual meeting of U.S. mayors today unanimously passed a resolution calling for stepped up federal efforts to access, mitigate and recover from the environmental and economic damage of the BP oil spill in the Gulf of Mexico. 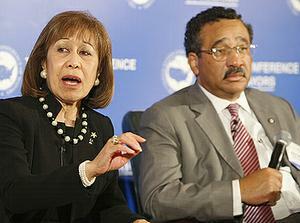 The resolution was put forward by Mayor Melvin “Kip” Holden of Baton Rouge, Louisiana and Mayor John Marks of Tallahassee, Florida at the meeting of the U.S. Conference of Mayors at the Cox Convention Center. Discussed on Sunday at an emergency session with mayors from Gulf Coast cities, the resolution asks the Obama Administration to work closely with mayors and other local officials in all phases of the national response. High-speed rail will bring great economic benefits to four hub cities – Los Angeles, Chicago, Orlando and Albany, according to a new report introduced today at the annual meeting. In all four cities, the introduction of high-speed rail will increase jobs, wages, business sales and value-added gross regional product, the report states. When inter-city travel time is under three hours, the benefits are even greater. By 2035, the report finds, high speed rail can annually add roughly $235 million in new spending in the Orlando area, $360 million in the Los Angeles area, 50 million in the Chicago area, and $100 million in the Greater Albany area. 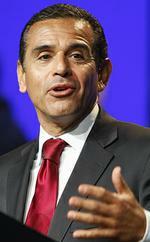 On this, the final day of the annual gathering, Los Angeles Mayor Antonio Villaraigosa said that his fellow mayors unanimously approved a resolution calling for federal policies and programs that would enable the 30/10 initiative to accelerate 12 voter-approved transit construction projects from 30 years to 10 years. Mayor Villaraigosa introduced a resolution encouraging the federal government to help local communities help themselves by leveraging local transportation infrastructure investments with federal funds. By establishing a national bond subsidy and direct loan program, the federal government can encourage cities to dramatically improve their transit systems to reduce dependence on the single passenger automobile and foreign oil while simultaneously reducing greenhouse gases and improving air quality. “Mayors from all around the country told me they see that 30/10 could be a national financing model to enable them to build and finance their own transportation projects, and I appreciate their enthusiasm and support for our proposal,” he said. The mayors also adopted a resolution calling for state and federal producer responsibility legislation that shifts the costs of managing problematic product and packaging waste away from taxpayers and local governments to producers and the consumers of their products. Lead sponsor of the producer responsibility resolution was Mayor Christopher Cabaldon of West Sacramento, California, whose city adopted a similar resolution in 2009. “Local governments are in serious financial trouble and can better use resources currently going to manage waste products like batteries, needles and fluorescent lamps to fund police, fire and basic public health services,” said Mayor Cabaldon. “We need manufacturers to take responsibility for what they make, not leave it to the taxpayers and ratepayers to clean up the mess at very high costs. The producer responsibility resolution supports state and federal producer responsibility legislation that levels the playing field for corporations that take “cradle-to-cradle” responsibility for their products and packaging, and urges Congress to support the ability of state governments to establish producer responsibility legislation. The resolution is based on a model developed by the Product Policy Institute that has been adopted by 95 local jurisdictions and local government associations in California since 2006, as well as by jurisdictions in New York, Massachusetts, Minnesota and Texas. In addition, the U.S. Conference of Mayors Saturday released its eighth national report on the status of brownfield sites in 150 American cities. Brownfields are abandoned or underutilized properties where expansion or redevelopment is complicated by either real or perceived environmental contamination. “Congress and EPA’s Brownfields Program has provided tools, but mayors need additional assistance with the redevelopment of these properties that will create new jobs and preserve city green space,” Foster said. This year 136 cities estimated that they collectively have more than 22,537 brownfields sites, with the average size of 8.6 acres. More then 120 cities estimated that 3,035 sites have been mothballed – the current owners have no intention of redeveloping or selling due to environmental concerns. Over 46 percent of the cities responding to the survey said that if brownfields were redeveloped, they could realize a total of nearly $688 million to $1.66 billion annually in additional tax revenues. Also, 106 cities responded that over 230,220 new jobs could be created on brownfields sites if they were redeveloped, an increase of 39,000 from last year’s report. There were 59 cities that reported 75,000 new jobs have already been created from redeveloped brownfields. More than half the cities surveyed reported offering incentives to encourage brownfields redevelopment through tax credits, low interest loans, and infrastructure upgrades. Preliminary findings from an ongoing national survey released Friday at the conference show that more cities are phasing out bottled water from city budgets. Up to 40 percent of bottled water comes from the same source as tap water and bottled water less regulated. Yet effective marketing has got cities that deliver tap water to the public spending millions each year on bottled water as public water systems face a $22 billion annual shortfall. Of the 101 cities surveyed, 44 percent have taken action to phase out city purchases and use of bottled water and an equal number cited promoting public water as the reason for taking action. The 2010 Mayors’ Climate Protection Awards were awarded to Chicago, Illinois Mayor Richard Daley and North Little Rock, Arkansas Mayor Patrick Henry Hays. Sponsored by The U.S. Conference of Mayors and Wal-Mart Stores, the Climate Protection Awards recognize mayors for innovative practices to increase energy efficiency and curb global warming. An independent panel of judges chose the winners from among 140 applicants. Mayors Mark Mallory of Cincinnati, Ohio, and Jennifer Stultz of Gastonia, North Carolina, were awarded first place honors in the 2010 City Livability Awards Program at the meeting. Sponsored by the Conference of Mayors and Waste Management, Inc., the award recognizes mayoral leadership in developing and implementing programs that improve the quality of urban life. The winning cities were selected by former mayors from among more than 200 applicants. 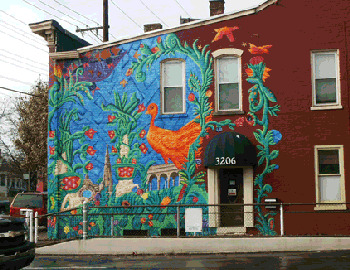 Muralworks employs teens and professional artists to paint at least one mural in each of Cincinnati’s 52 neighborhoods. Where once there were bare walls and blighted lots, there are now 26 colorful, vibrant murals in 20 Cincinnati neighborhoods. Seven more are planned for this year. Over the the past three summers, 280 teens and 80 professional artists have been employed, and their work has transformed Cincinnati as a whole, the judges said. In Gastonia, the judges recognized the “Hope for Gaston” faith-based outreach ministry, which repairs homes in targeted neighborhoods. Two projects in 2009 upgraded more than 50 homes and provided 1,010 boxes of food, enough to feed a family of four for a week, to families in need. The U.S. Conference of Mayors is the official nonpartisan organization of cities with populations of 30,000 or more. There are 1,139 such cities in the country today, each represented in the Conference by its chief elected official – the mayor.